Cohousing Network, The (TCN) - An organization whose purpose is to promote and encourage the cohousing concept, support both individuals and groups in creating communities, provide assistance to completed groups for improving their systems for living together in community, and provide networking opportunities for those involved or interested in cohousing. Communal Studies Bibliography (1993-2012) - Compiled by John Goodin, Preus Library, Luther College . Farm, The - Founded in south-central Tennessee in 1971, The Farm has pioneered a wide range of social and physical technologies appropriate to low-cost, high satisfaction community living. Flickr Group: Communes, Ecovillages, and Intentional Communities - Photos of community. 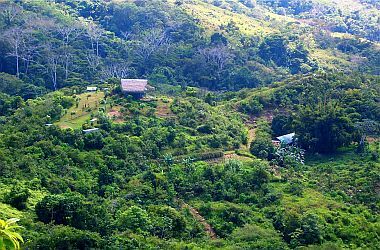 La Joya del Sol (Jewel of the Sun) - A nature-inspired, intentional community nestled in 67 hectares in Costa Rica's south Pacific coastal mountains. Its lush tropical rainforests, clean waterfalls and pools, and breathtaking mountain scenery an hour from beautiful beaches, is designed to attract conscientious people looking to live fully and reconnect to divine nature. Global Trust - A grassroots non-profit organization that links together ecovillages and related projects around the world. GEN promotes and supports models of sustainable living globally, in order to inspire and encourage the creation of more viable lifestyles on this Earth. Intentional Communities - Information and resources for seekers of community, existing and forming communities, and other friends of community. Also see Directory and Magazine. School of Living - An educational organization dedicated to learning and teaching the philosophy, practices and principles of living that are self-empowering for individuals within the general aim of establishing decentralized, ecologically-sound, self-governed and humane communities. Society for Utopian Studies - An international, interdisciplinary association devoted to the study of utopianism in all its forms, with a particular emphasis on literary and experimental utopias. Solar Community Housing Association - A Davis, California-based 501(c)(3) non-profit that has been providing environmentally conscious and affordable cooperative housing since 1979. Sustainable Communities Network - Find out what's happening in Chattanooga, Tennessee, and Seattle, Washington; what the Green Institute is doing in the Phillips Neighborhood in Minneapolis, Minnesota; and how the Mountain Association For Community Economic Development and Rural Action are helping rural areas of Appalachia. Learn about principles of sustainability and visioning processes and how they can help guide community initiatives . Discover how community indicators in Olympia, Washington or Jacksonville, Florida are helping residents define and inventory what they value. Tiny House Community - This site was created to support the formation of a tiny house community. Additionally, it provides links to workshops for those interested in designing or building a tiny house, followed by a list of designers and builders of tiny houses. William Morris Internet Archive - Works, biography, photos. WWW Resources on Alternative and Utopian Communities - General resources on utopian, intentional or alternative communities, and related information. This webpage last updated on Wednesday, January 6, 2016 3:19 PM.